Sure, you can head up to Russian River Brewing Company in Sonoma Valley, California and deal with an 8 hour line, or you can keep reading and get your taste of this ever-so-popular, award winning, seasonal triple IPA at one of San Diego's best beer bars. 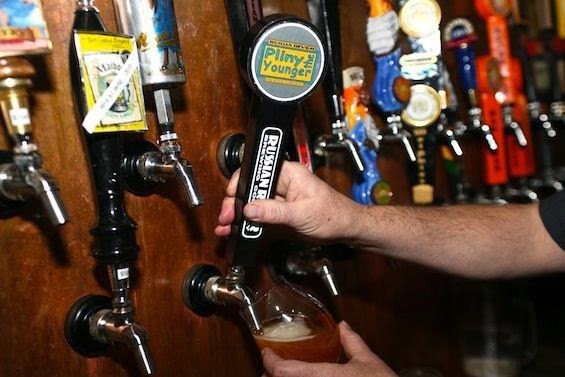 The extremely limited release of the 11th Anniversary Pliny The Younger is being distributed throughout San Diego by none other than Stone Brewing Co., so whatever bars receive kegs of "The Younger" will be getting them directly from Stone. We've got the scoop on when and where it will be arriving, so keep reading, mark your calendar, and get a taste of one of the world's most coveted brews. 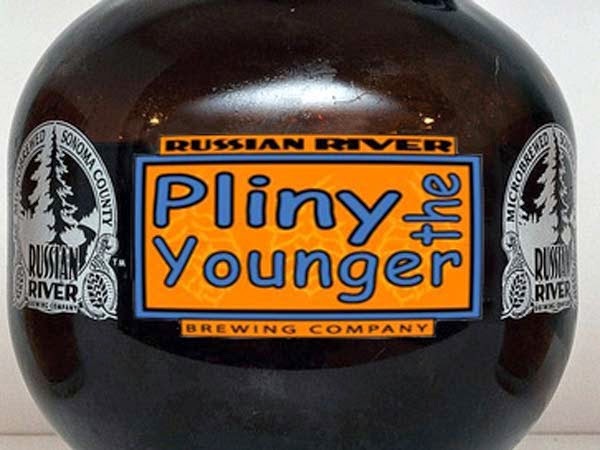 Pliny The Younger could arrive in San Diego as early as February 9, much earlier than last year when Stone Brewing Co. received the shipment of The Younger on Valentine's Day. Word on the street is that Stone won't be delivering its kegs until as early as Tuesday, February 10. Pizza Port Carlsbad will tap their keg on February 24th at 11am. O'Brien's Pub is reportedly receiving numerous kegs, and will tap them at different dates and times, with the earliest being Saturday, 2/14 at 5pm and another on Tuesday, 2/17. They will presell glasses to benefit charity - $20 per 10 ounce glass, starting on Friday the 13th. Sign up for their newsletter for an inside scoop. Toronado will likely receive their first shipment as early as 2/10, and will likely tap another keg on Friday, Feb 13. Downtown Johnny Browns will be offering The Younger starting at 2pm on Sunday, 2/15, tapping for those that bought tickets, and 8pm pouring to those without tickets. Churchill's Pub and Grill in San Marcos is unveiling their keg of Younger on March 7 at their annual Renaissance Party. Expect lines out the door and the keg to be kicked within an hour of their opening (11am). Rumor has it that people camp out overnight to secure their spot in line. Blind Lady Ale House remains secretive about their release, but they confirmed that they will be receiving Younger and will advertise the tapping in advance via Facebook and Twitter. In celebration of their 8th Anniversary, San Diego TapRoom in Pacific Beach will be tapping Pliny The Younger at their anniversary celebration and beer festival on Saturday, February 28 and another keg on Saturday, March 7. Encinitas Ale House will be tapping its keg of The Younger on Sunday, Feb. 22 at noon only for those who have bought a prepaid card. They started pre-selling tickets at 4pm on Monday, Feb 16. EAH will also be opening at 4pm on Monday, Feb 23, with a fresh keg of Younger, no tickets needed. Tiger!Tiger! confirmed they'll be receiving a keg, and they said that there will be "plenty of announcements," so keep checking their website, Facebook & Twitter. Hamilton's Tavern would neither confirm or deny that they'll be getting a keg, but they most likely will be and have it on tap on Wednesday, February 11. Fathom Bistro will certainly get at least one keg of The Younger. Follow their Facebook page and keep an eye on the draft board. Neighborhood will receive a keg on 2/10 and plans to put it on "as soon as something else blows." Pliny the Younger is categorized as a “triple” IPA, simply meaning that it is higher in alcohol and has tons of hops. The alcohol percentage is about 10.25% and is very hop heavy. It was brewed for the first time 11 years ago as a winter seasonal, building upon the famed Pliny the Elder recipe. It is always brewed only once a year and released at Russian River Brewing Company on the first Friday in February, rain or shine, and there is consistently 100 plus people waiting for doors to open on that first day, with lines remaining until the supply is out. Be sure to call ahead to whatever establishment you'll be patronizing to assure tap times and availability. Once tapped, this beer goes FAST. You can also set up an email alert at Taplist.com and TapHunter to find out when Pliny The Younger arrives. Cheers to delicious beers!! !